MANILA - (2ND UPDATE) A 10-year-old girl in Mariveles, Bataan died of severe dengue some 6 months after she was given a vaccine for the mosquito-borne illness, which is now at the center of a health scare, the Volunteers Against Crime and Corruption claimed Thursday. Health Secretary Francisco Duque said the case is still subject to validation. "I asked the same question to mayor of Bataan. Yun daw sinasabi nila because they received the vaccine but people from DOH told me may pre-existing condition. This is subject to validation...I have yet to see the full documents on alleged deaths," he said. 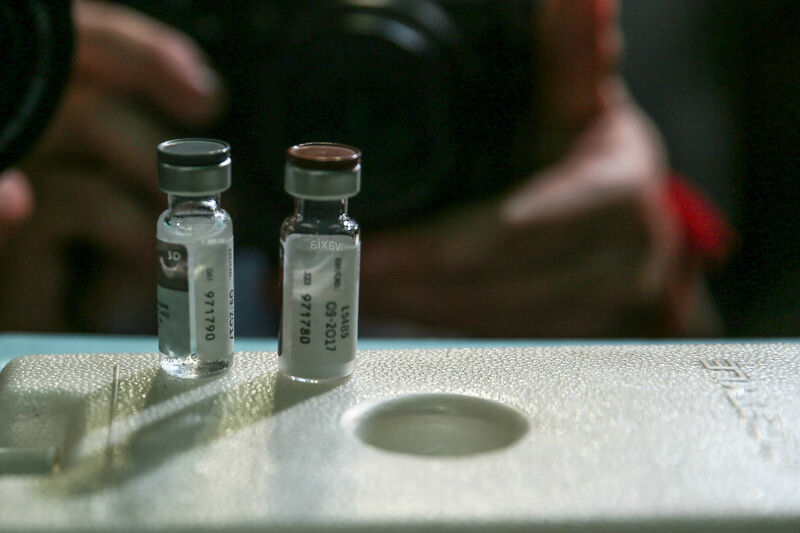 The world's first dengue vaccine Dengvaxia could lead to "more cases of severe disease" if administered to those who have not had dengue before, French drug maker Sanofi Pasteur said last week, prompting the government to suspend its vaccination program. The fatality from Bataan, "Christine Mae", had no prior dengue history when Sisiman Elementary School gave her the vaccine in April 6, 2016, her parents told VACC, the group's founding chairman Dante Jimenez said. Christine Mae died of "disseminated intravascular coagulopathy due to dengue severe" in October 2016, Jimenez told DZMM, citing a death certificate shared by the girl's parents. VACC, he said, has taken custody of Christine Mae's family and will request their inclusion in the government's Witness Protection Program. Duque said the Department of Health is looking into 2 supposed deaths in Bataan, but it was not immediately disclosed if Christine Mae's was one of them. He said he has spoken to Bataan Representative Joet Garcia, who told him that talks indicated that the deaths were "because they received the dengue vaccine," but the health officials say they were because of a "preexisting condition." One, he said, had a "serious cardiac problem" and another had an "acute gastroenteritis" that led to dehydration. In Cebu province meanwhile, doctors are closely monitoring a 10-year-old boy who was given Dengvaxia and is now suffering from dengue, an ABS-CBN report said. The VACC claimed Monday that 3 children who received the vaccine in Central Luzon have died of dengue. Sanofi however had said Dengvaxia would not cause anyone who was immunized to die and that potential cases of "severe dengue" would not be fatal. Meanwhile, VACC counsel Ferdinand Topacio said an "insider" at the Department of Health is ready to bare at a Senate investigation the alleged anomalies in the dengue vaccination program rolled out by the previous Aquino administration. VACC's witness, a doctor who has been with DOH since the 1990s, is set to testify that the vaccination program was launched in vote-rich regions just a month before the May 2016 elections, and not in areas with the highest number of dengue cases, Topacio said. He also alleged that the then acting director of the Food and Drug Administration Philippines (FDA) who approved the use of Dengvaxia, Kenneth Y Hartigan-Go, was tied with a firm that distributed the world-first vaccine. "Lahat po -- from the purchase ng vaccine, funding ng vaccine pati sa pagbigay ng bakuna at approval ng FDA na napakabilis nagkaroon -- budbod ng anomalya po ito ," Topacio told DZMM. "This witness together with other witnesses -- marami naman po iyan na ipinatawag ng Senado -- kapag tinagpi-tagpi niyo iyan, makikita niyo po iyung buong puzzle kung paano nagkaroon ng napakatinding anomalya na hindi lang po pagnanakaw sa bayan kundi inilagay pa po sa peligro ang 733,000 na bata." The VACC is studying lodging a class suit against the pharmaceutical giant, said Jimenez. Jimenez said he also wrote a letter urging the Department of Health to find a drug to negate the vaccine. The Department of Justice said Monday that the National Bureau of Investigation would investigate the vaccination program "over the alleged danger to public health. The Senate Blue Ribbon Committee, which investigation into the vaccine's procurement, will re-open its probe on Monday, said Senator JV Ejercito, who will co-lead the proceedings as chairman of the Senate health panel.